Red Bull boss Christian Horner has warned that a small penalty for Mercedes' alleged breach of Formula 1's team radio rules could open the floodgates for teams to choose to tactically break the rules in the future. 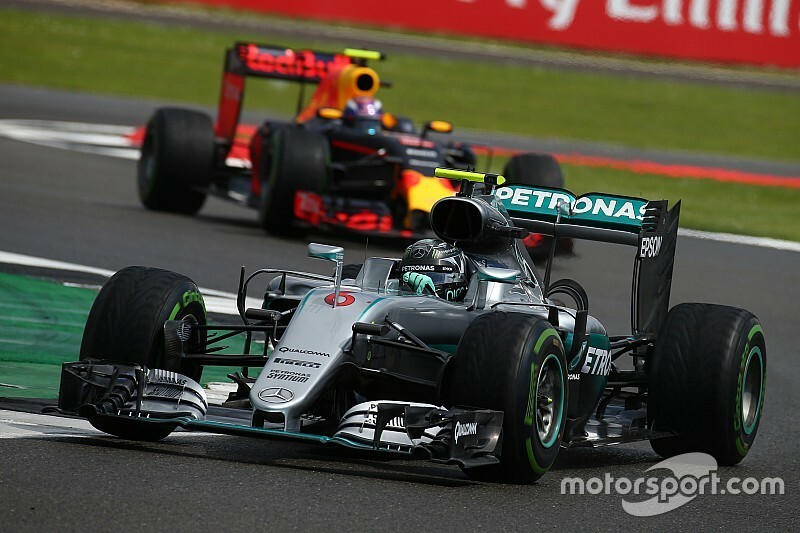 Nico Rosberg's runner-up place in the British Grand Prix was under investigation from the race stewards after it was decided that instructions he got from the pitwall to solve a gearbox problem in the closing stages were illegal. Speaking before stewards gave Rosberg a 10s penalty, Horner said that if the FIA did not come down hard on the matter then in the future teams will elect to deliberately take penalties if they know a potential performance advantage is worth more. "What will be interesting to see is the precedent that the stewards now come up with, because if if it just a five-second penalty or a reprimand, then it is all fair game for the rest of the year," said Horner. "There will be loads of messages that will take into account whether it is worth five seconds or not, or a reprimand to give to the car. "What will be interesting to see is the precedent that is set by Charlie in the stewards because they [the FIA] made it very, very clear – explicitly clear going into this weekend – what their expectations were." As Motorsport.com revealed earlier this weekend, the FIA had told the teams that from now on any breaches of the radio rules would be sent to the stewards as part of a clampdown on the situation. Horner said that irrespective of the rights and wrongs of radio limitations for teams, he felt Mercedes was in breach with its instructions. "I think the [radio] rule is rubbish," he said. "It doesn't make a great deal of sense but the rules are the rules, and on two counts it sounds like instructions were given that breached that protocol. "One was the switch change that was made and on the second, was the instruction on how to drive the car with the seventh gear issue that they had." When it was suggested that Mercedes felt that Rosberg's problems were critical – so therefore allowed – Horner responded: "Maybe so – but they still told him how to drive the car with a selection of gears or so on. It is in the hands of the stewards. It is not for me to judge on. "All I see is that the rules are the rules, whether they are good rules or not: there is loads of information that we would like to give the drivers but we can't. It is now down to the stewards." Horner also brushed off any suggestion Red Bull had been in breach of the rules by telling Verstappen that Rosberg was under investigation. "That is strategy," he said. "The car ahead has got an issue effectively, that is not instructing him how to drive the car or change any switches, or miss any gears out."